Procuring A/E services based on qualifications seems the obvious choice. But it's a message NSPE must continually repeat. 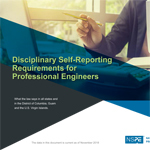 Over the past 40 years, the U.S. and the engineering profession have undergone fundamental changes. In 1972, no one could have predicted the profound impact innovative technologies would have on the engineering community. Nor could one have foreseen the multitude of alternative project delivery methods that engineering firms can now use. Change is inevitable and critical to progress. However, in certain instances, time-tested measures still prove to be the best approach. Perhaps nowhere is this more apparent than in federal procurement. Although the last several decades have seen the emergence of new project delivery methods for federal procurement, one innovative approach, the use of qualifications-based selection, has consistently yielded the best results. For those who are not familiar with it, QBS, which was formally codified in the 1972 Brooks Act, provides for the selection of firms to perform architecture, engineering, and related services on the basis of the competence, qualification, background, and track record of competing firms, subject to the negotiation of a fee that is fair and reasonable to the government. With QBS, federal agencies are mandated to publicly announce requirements for professional A/E-related services. Interested firms compete by submitting their qualifications and the agency then evaluates the firms' submittals and selects a short list of most qualified firms for an interview. Based on evaluations of the firms' qualifications, experience, past performance, and other factors, the agency determines which firm is the most qualified to meet the government's requirements. The government prepares an independent estimate of the anticipated cost, and a negotiation is held between the government and the selected firm to arrive at a price that is fair and reasonable to the government. If a fair price cannot be negotiated, the government is free to terminate the negotiation and begin discussions with the second-ranked firm. As a testament to the success of the QBS process, more than 45 state legislatures have enacted "mini-Brooks Acts" as state laws. Moreover, QBS is endorsed by the American Bar Association in its Model Procurement Code for State and Local Government. Although QBS does not solely apply to transportation and infrastructure, given the tremendous number of these projects, it is particularly important that QBS is followed in these sectors. Consequently, on August 9, NSPE sent an open letter to the new Secretary of Transportation Anthony Foxx, urging him to strongly support and encourage the use of qualifications-based selection in the federal procurement process. Now, after a sustained period of economic hardship and particularly since sequestration went into effect, there has been a concerted effort to place a greater emphasis on competitive bidding, in which cost would be a primary factor in determining the firm awarded a given contract. This approach poses a grave danger to the public health, safety, and welfare, which every professional engineer has an obligation to protect. Focusing on short-term cost-savings allows lesser qualified and inexperienced bidders to secure contracts for projects that, if completed without the proper expertise, can cause property damage, bodily harm, and prohibitive long-term costs. In fact, there is no evidence that selecting architects, engineers, and related professionals on the basis of qualifications results in higher costs. To the contrary, quality design pays off in the long run. After all, design-related services only amount to less than one-tenth of 1% of the total life-cycle cost of a structure or facility but affect the operation and maintenance costs over the life of the facility. A study conducted by the University of Colorado and the Georgia Institute of Technology, drew from a database of approximately 200 public and private construction projects in 23 states, and included transportation, water, commercial, and industrial projects, ranging in size from relatively small projects to those costing hundreds of millions of dollars. The authors compared various procurement methods, including QBS, best value, and low-bid, with such factors as total project cost, projected life-cycle cost, construction schedule, and project quality outcome. Results showed that using QBS to procure the design component of a construction project "consistently meant lower overall construction costs, reduced change orders, better project results, and more highly satisfied owners than in other procurement methods." In the open letter to Secretary Foxx, NSPE President Robert Green, P.E., F.NSPE, addressed this key issue, stating, "Research shows that government agencies in the United States achieve lower construction costs, more efficient use of taxpayers' money, and higher construction satisfaction when procuring design and engineering services based on qualifications rather than price. By strongly supporting and encouraging the use of qualifications-based selection in the procurement of transportation projects, you can help ensure that the nation's transportation system will be safe, sustainable, cost-effective, and an example to other countries for generations to come." Qualifications-based selection has ensured successful procurement policy in the past. Our future success will depend on the extent to which we use this approach as we move forward. Arielle Eiser is NSPE's government relations manager.